Employers are looking for graduates with the skill set honed by the K-Plan — leadership, work ethic, written and oral communication, problem-solving, adaptability and teamwork. The Center for Career and Professional Development helps students recognize and articulate how their particular K-Plan has developed these skills and prepared them to succeed in a fast-changing, technologically driven global employment market. The services of the Center for Career and Professional Development support students and alumni at all points in their career discernment and development. Early in the process of career decision-making, we offer career coaching and assessment tools to help students explore and set goals. Our team assists students one-on-one and in workshops, first to ask the right questions and then to find their own right answers. The Center for Career and Professional Development helps students recognize and articulate their skills while preparing them for professional life. Students learn about the world of work through a series of career-related immersive field experiences, including our nationally known Discovery Externship Program. An externship offers the same benefits as an internship in a shorter time. Students live with K alumni for a week or two to experience the life patterns around a particular career path. This program has helped many students make decisions about their career paths and build networks. Other uncommon immersive experiences include a suite of K-Treks trips to various industries and locations around the country. As students move closer to launching their careers after graduation, we provide more targeted opportunities to network and gain experience. Handshake, a leading career platform used at more than 700 schools and more than 300,000 employers, makes personal recommendations based on a student’s interests, skills, major, location preferences and search history. Our annual recruiting expo brings employers to campus to share information and seek candidates. 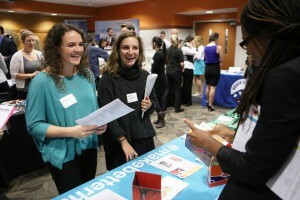 And our online communities of alumni professionals, the Wisr Career Mentoring Network and the Kalamazoo College Professional Networking Group, give our students built-in networks of mentors and connections that last throughout their careers.